Election mania is at an all time high in the country right now. Be it the TV, radio, newspapers and the Internet, we are coming across all kinds of election news and tidbits 24/7. Many of us are interested in predicting what the results will probably be like. A lot depends on which party wins at the national level and which politician is elected at the local level. There is tonnes of data out there in the media but is it objective and correct? We don’t know yet. So wouldn’t it be better if we could predict and understand the political climate based on innovative methods like crowdsourcing? Hyderabad based development company Monocept has launched a mobile app called Voting Line which aims to provide us these answers. Voting Line lets users create their profiles and fill out some personal information such as State, Constituency, Age, Gender and so on and asks you to register your vote on both the Lok Sabha and the State elections. Just to clarify, this is not an actual voting app but seeks to understand voter opinion across the country. After you have voted, you are presented with a report that shows which party or politician dominates the votes in your state or on the national level. You can vote daily and see how the trends are changing. 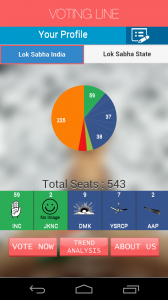 The app generates results in terms of percentages and thus helps you understand where the people and the political parties stand on a geographical basis. It also stacks voter data with respect to parameters like Age, Gender, Religion, Caste, Education and so on. These percentages are calculated by collecting the daily voting results from users. The company specifies that the data you give them is anonymized and none of it is passed to a third party. Monocept has also clarified that they are not part of any political party. 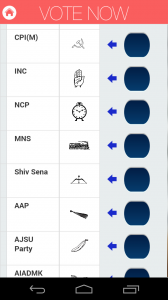 Can Voting Line app predict and analyse elections? The idea sounds good and the app is indeed helpful but only when it comes to volume. On the whole, it seems to have around 1000 installs. That is not really enough to predict and analyse election results and voter opinion across a large country like India. We can keep using it but unless the app scales to a huge number (probably in lakhs), we cannot actually predict much. I think that Monocept should tie-up with some leading news media company and push the app to a greater audience in order to reach the scale where it can be considered relevant. According to the company, the elections are phase one of their product strategy. The app will then be applied in order to gauge audience opinion in events such as sports, soap operas, reality shows, movie screenings, etc. This seems very promising! You can download the app for Android, iPhone and Windows Phone.